Took me a minute to figure out which photo you were talking about. I'm assuming the one of Duffy standing in the exit hallway of Captain EO? I love that shot. Totally did it on impulse before they started to close the doors for the next performance. 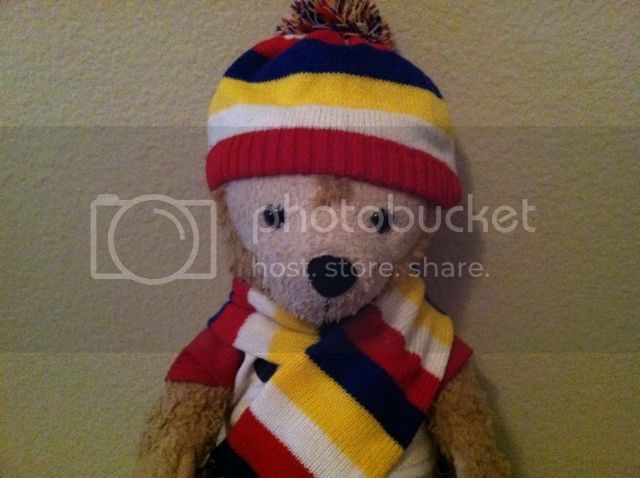 Hi Aimster, just caught up and your pictures are fab, loved the story behind them too! I hope to one day take both Shellie May and McDuffy to meet some characters! I think our next holiday (in a few years time) will be to Japan so that will be perfect! Until then we'll have to make do with local trips and short visits here in the UK! So here are some more pictures from our first day of sight seeing! We were staying right near a mall, The Newport Center which was also where the train station was. Our friends from Florida were due to arrive mid morning, so we had a wander through the mall to see where we could get the train and also just to see what the area was like! 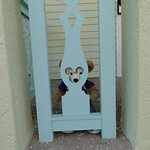 First thing Duffy spotted was the kiddie rides! And of course as he loves the sweet stuff he chose the ice cream van! 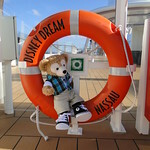 We also checked out where the Disney Store was, it wasn't open yet but Duffy wanted a picture of himself there anyway! Duffy was very excited to see a real live lighthouse! This one was called Lefrak Point Lighthouse and we were just so fortunate to have such a glorious day! We also found a beach of sorts, not sure I'd want to sunbathe here! After a lovely stroll we headed back into the mall for some shopping, of course we went to the Disney Store - I came away with a set of the Designer Villians lithographs, a Tangled Ever After Pascal (complete with a cute bow tie!) 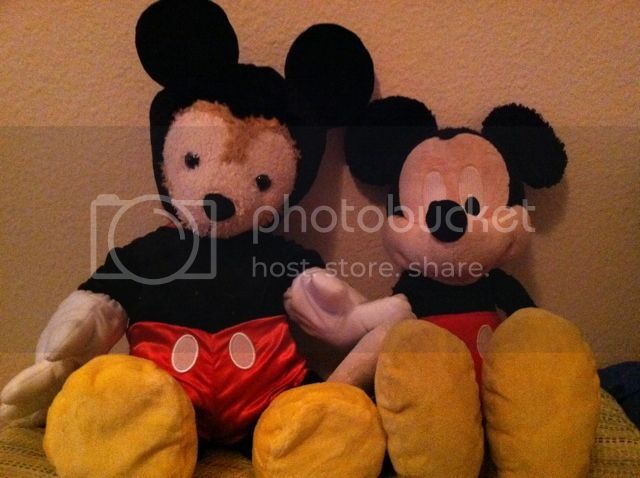 and some shopper bags that were on sale :thumbup: these bags are perfect for Duffys outfits! After that we followed our noses to Yankee Candle as there are so many items we cannot get here in the UK or they are a lot more expensive. We stocked up on room spray and car fresheners as well as a new gel container for the bathroom. So I went to Downtown Disney (again) and bought a couple of new outfits for my Duffy and one piece of merchandise related to him. Love the one of Duffy driving the ice cream truck! 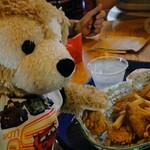 Duffy is a little piggy! 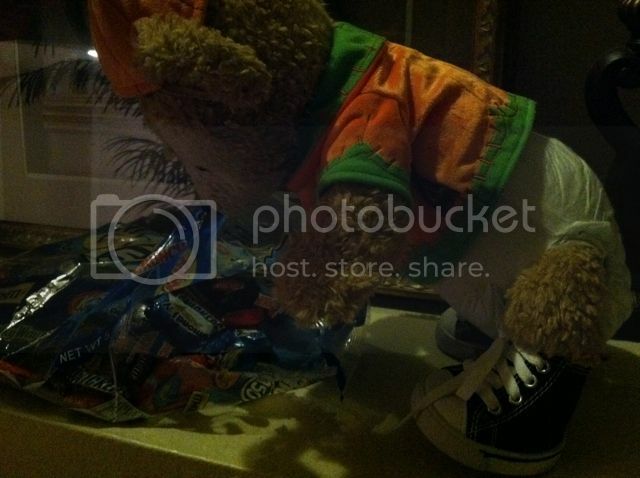 This is all the candy we have left from last Sunday's haul at Mickey's Not-So-Scary Halloween party. The bag initially weighed 2 or 3 pounds! My mom sent Duffy a Detroit Tigers 2012 American League Champions shirt! We've been very disappointed in their World Series performance so far (if they lose again tonight it's all over). My mom sent ME a gift card to Red Robin, so we went there for dinner Friday night. Duffy REALLY wanted my bleu cheese burger, which as always was awesome. His nose was going a mile a minute. I let him have some of my fries though as they do bottomless fries at Red Robin (and they're the yummy fat steak fries). After dinner, we went into the mall. I had a rewards thing from Build A Bear, so Duffy picked out a new shirt and some Ray-Ban style sunglasses (because we've misplaced his aviator shades). Yay for free stuff! Shellie May likes how 80's New Wave Duffy's new shirt & shades make him look! Oh and we got these cool free masks at BAB too! Ha what a coincidence! My kid did a report and made a model of the Lefrak Pointe Lighthouse last year! You were close, Aimster! It's actually the Cast Member outfit for the Golden Zephyr (and maybe some of the other rides at Paradise Pier). 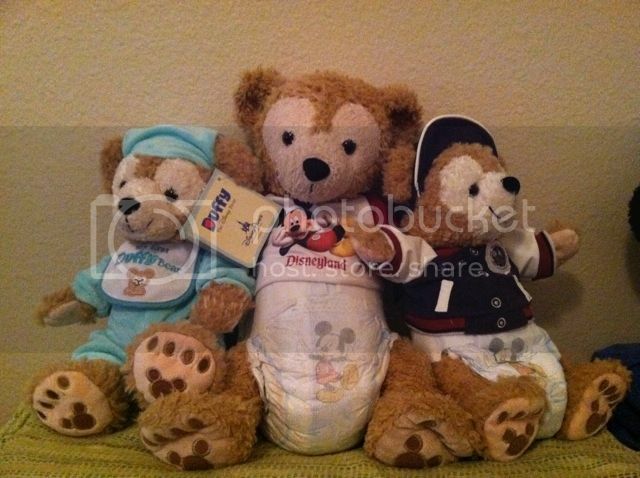 Your Duffy is SO STYLISH in his BAB clothes! Shellie May's different color bows are adorable! Wow, Becx! What a trip! Now I want to try a peanut butter-grilled cheese. Would probably be terrible, granted, but maybe your Duffy would like it. I had no idea that real lighthouses were painted like the one at Disneyland! 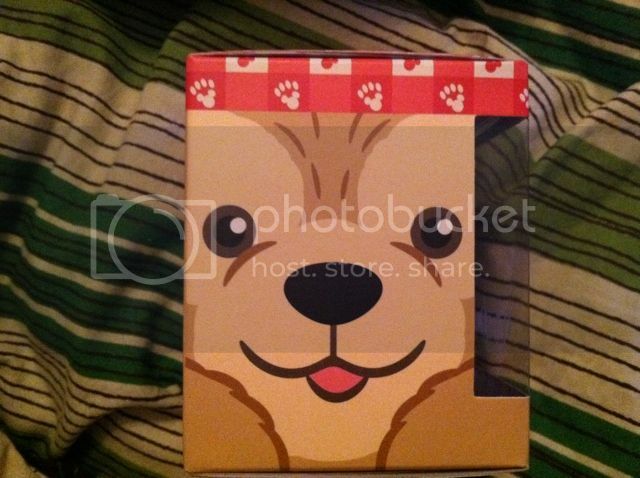 Thanks for the pics, MikkiMausu! 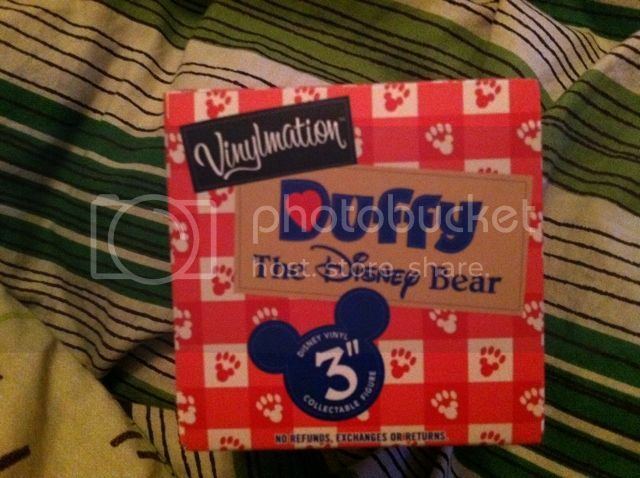 I love the packaging on the Vinylmation. 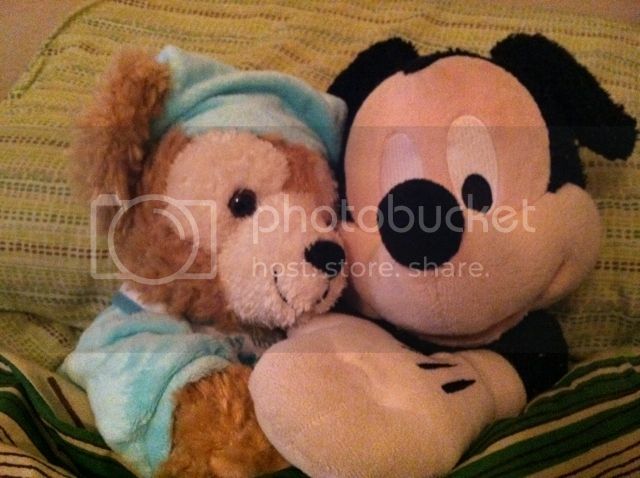 Duffy's Mickey outfit is fun! 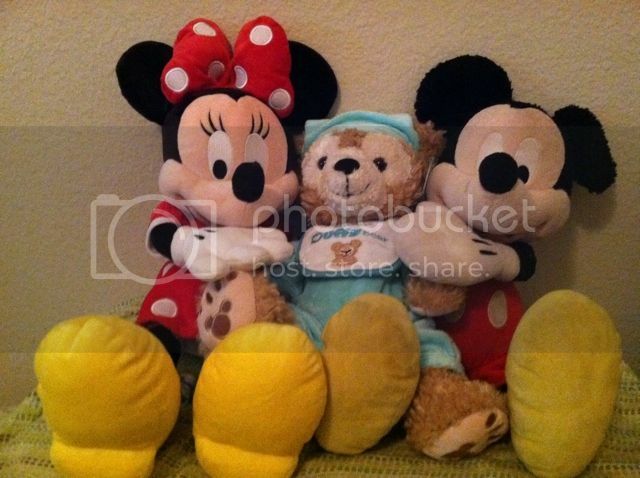 And Mickey and Minnie are very cute with their new baby Duffy. Lil D and Duffette in their costumes, ready to go trick or treating! Lil D let Duffette wear the Minnie Mouse costume this year, while he went as an adorable pumpkin. "Wow, it's hard to believe so much candy fit into these tiny pumpkins!" Happy Halloween to all our Duffeteers! 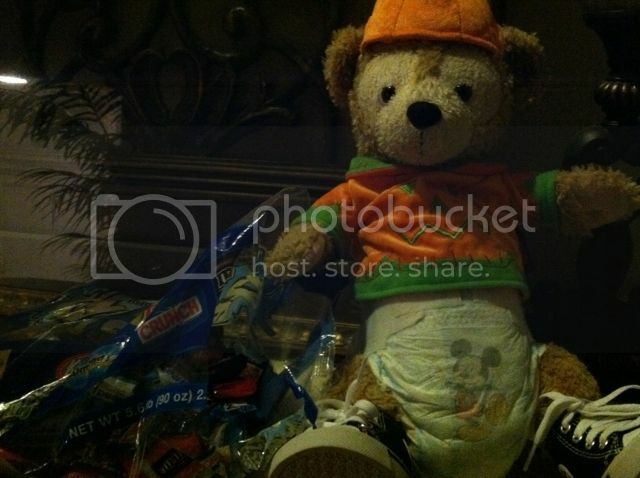 And here he is getting ready to give candy to trick-or-treaters. Clara - I didn't know anything about that particular lighthouse before we went there, just thought it was a cute photo op! How cool to make a model of it! After our snack we headed back to the hotel and once our friends arrived our next stop was NYC! It was easy to find the station and we didn't have to wait too long. One thing I wasn't expecting was armed guards once we got into the city, it really brought home that it was the 11th. We wanted to see a few things in Central Park so we hopped on the subway and got off a few blocks away. As we were walking towards the park we tried to cross the street but they were filming 666 Park Avenue so we had to go along a bit further. The next block down had lots of production trucks with doors on the back, like there was a set inside and then a door off the back of the truck! Our first stop in the Park was the Alice In Wonderland statue! I'd seen it before but we made sure we took plenty of pictures, it is very detailed and kids seem to love playing on it! 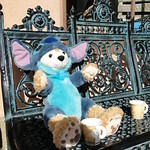 As did Duffy! Me and the girsl! 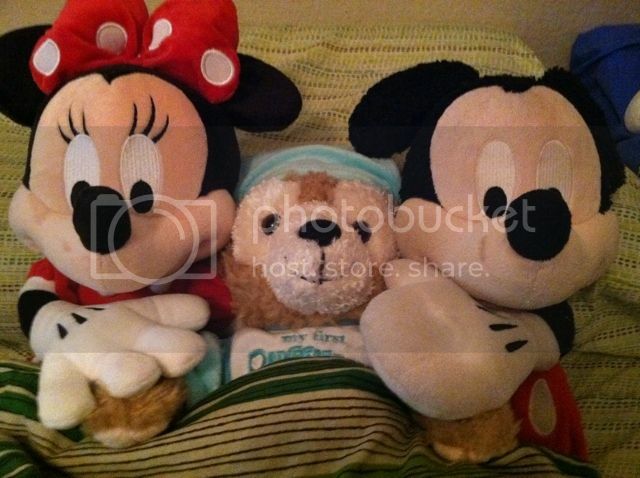 From left to right, it's Daniella, Me and Duffy and Krissy! "You're not an Ugly Duckling"
We wandered some more and came across a tunnel, Duffy had heard that trolls can be found under bridges so was a bit reluctant to go, but we assured him we'd protect him from any meanies that may be lurking! The Bethesda Fountain, you can see how gorgeous the weather was! Not too hot but lovely and bright! The inside of the terrace was very ornate, it would be a beautiful setting for a wedding ceremony! Actually, I looked at his report again and realized it was the Montauk Point Lighthouse that he did the report on and we made the model for. But it looked almost exactly like that one. WIth the stripes and all. OMG! That fountain was in the fall season finale of Doctor Who! There are "weeping angels" on it! Don't blink! 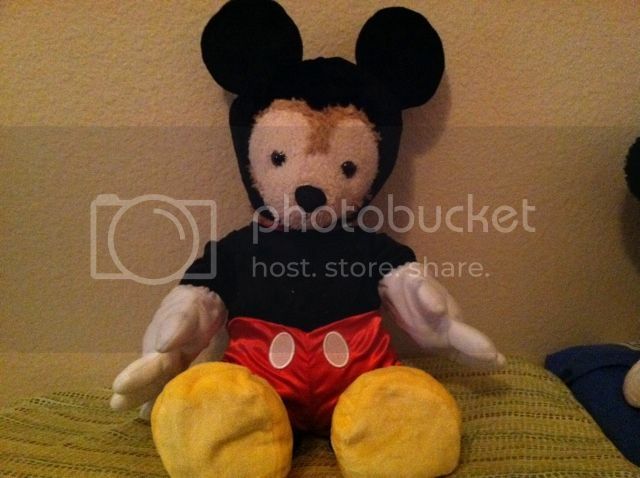 Ride that invisible horsey, Duffy! Is Duffette wearing a Shellie May costume or BAB? 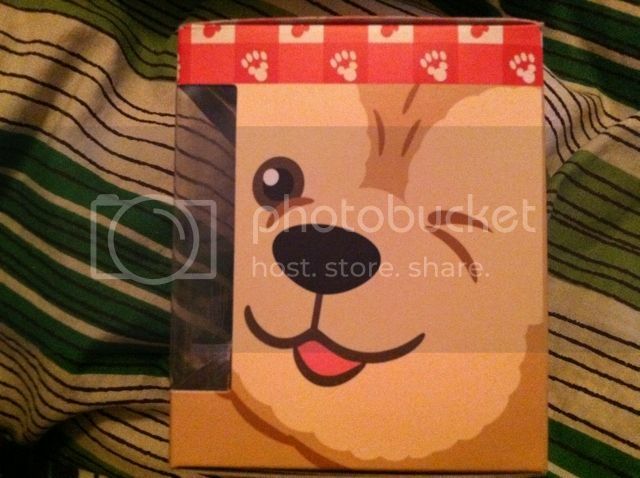 It's SO cute!
) lighthouses can look similar! But still sounds like a fun project! Yes, they scare the wot nots out of me The way they creep up on you. 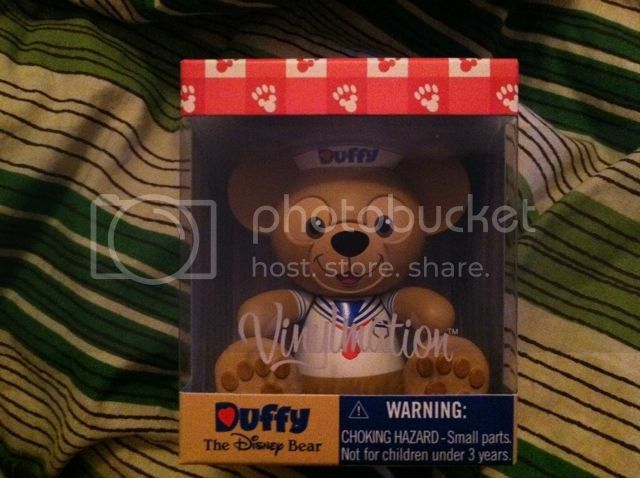 I saw those pics on Facebook (some photos are blocked at work ) still not sure if I'm a fan of the song but go Duffy! Tiggers and Eeyores and Pooh bears oh my! They had some nice back drops, but I think I prefer the Store in London, this one seemed very small and didn't have a great selection. We got a NYC Vinylmation, a couple of pins and a t-shirt. How cool would this be to have at home! After that we were all agreed we were exhausted and went to find some food before heading back. On the way we spotted some 'fake' characters - I didn't want to be asked to pay for a picture so I snapped a quick shot from behind. They were really bad imitations! We got pizza at a small place a couple of blocks from Times Square (our friends had been there on their last trip to NY and luckily remembered where it was) it was very reasonably priced and really yummy! I didn't get a shot this time but we had another trip into NY after the cruise and went there again! Aimster - Love Gangham Style! Becx....I wonder how the WOD NY is holding up after Sandy. Great shots! Last edited by clara; 11-02-2012, 08:45 AM. The WOD is holding up fine. It has power, and wasn't affected too much by Sandy. It's the stuff below 39th street that gets weird, and things along the river's edges (both East river and Hudson river). I'm lucky I had power, since most of my city doesn't still. 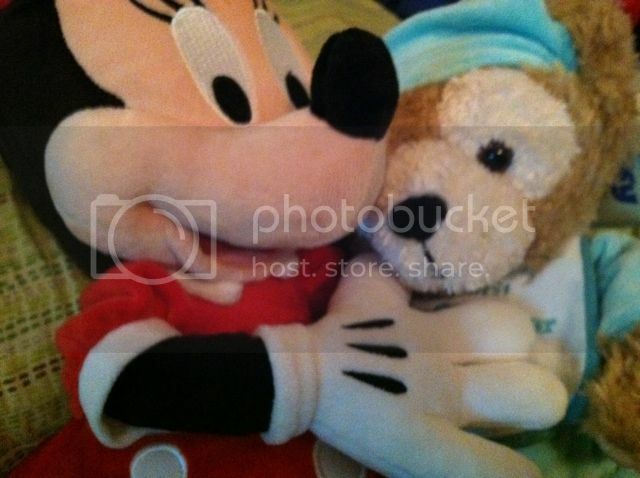 :yea: wow they are adorable! I just want to scoop them up and hug them forever :love: They just look so animated! I do hope they didn't get all sugared up and kept you up all night? I can't imagine how much disruption has been caused and my heart goes out to those affected.